Explore the Hall Effect in a GaAs semiconductor. Explores systematic errors and their elimination. 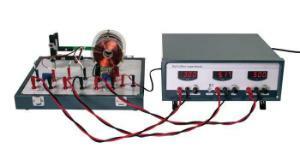 Determines the conductivity of the semiconductor. This Hall Effect Apparatus consists of a mounted n-type semiconductor chip on a traverse mechanism, a pair of coils, relay-controlled reversing switches, and a control unit with connecting cords. Uses the semiconductor to plot the coils magnetic field. The Hall Effect is the generation of a side-to-side voltage in a conductor or semiconductor carrying a current when it is placed in a magnetic field. The effect is widely used in magnetic field sensors. It is associated with several well-known systematic errors, some of which can be eliminated by special measurement techniques.